So long, tangled and jumbled cable mess. 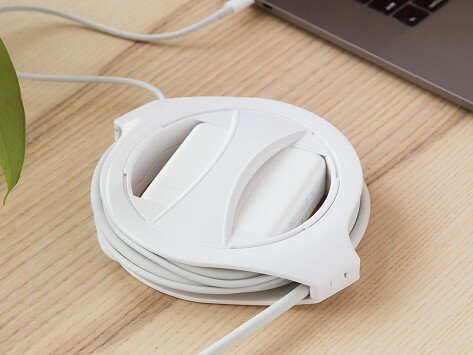 This MacBook charger cord wrap winds it up in five seconds—no, really—and keeps the cable neatly organized, perfect for popping in your backpack or bag. This also helps prevent the cord from fraying and breaking. Dimensions: 5" x 4" x 1.25"
A Product I Didn't Know I Needed! It really cleans up excessive cord clutter. While he was a university student, Logan Bailey looked for a MacBook charger cord wrap and came up short. So this entrepreneurial spirit decided to make his own way to keep the cable in check. The side winder works like a reel. It winds up the charging cable in under five seconds and keeps it neatly and compactly organized. Not only does this prevent a tangled and jumbled cable in your bag, it also helps to prevent the cord from fraying and breaking. When we tried it out, we liked how the side winder lives on the cable, so it’s always at-the-ready to do its reeling job. And now that we’ve experienced how easy it is to use, and how organized it makes things, we don’t want to go back to the messy, tangly way we used to roll.